Shouldn’t those who pick on the attire of others be focused on their religious obligations instead of being the fashion police? A few months ago, my son showed up for Friday prayers at a mosque in Kuala Lumpur in a t-shirt with the word ‘Carlsberg’ written on it. An elderly gentleman took him aside to ‘advise” him on his attire. The size of the word on his tee was really tiny but in some weird way managed to catch the pakcik’s eyes. My son was careful not to wear anything similar again. He began to avoid wearing any t-shirt with words on them when visiting mosques. A few weeks later, on a visit to another mosque for terawih prayers in Ramadan, he was approached by yet another pakcik, who claimed my son’s t-shirt once again was unsuitable to be worn to the holy place simply because it had a 10 cm x 10 cm picture of Spock, from the famous TV show, Star Trek. According to the man, wearing attire with improper visuals could disturb others from fulfilling their prayers. Back home, my curious 16-year-old decided to seek clarification over the matter. I explained that the most important thing when choosing attire for prayers was to pick something clean and that covered the aurat. “Then what is wrong with my t-shirts?” he asked. “My t-shirts are comfortable, clean and proper. What makes you think they are not suitable?” he retorted, unsatisfied with my explanation. “Remember when you spent a good one hour dressing up for your friend’s BBQ dinner? When you can put in lots of effort to look presentable for a visit to your friend’s house, why not do the same when you are visiting the house of God?” I asked. My boy went silent for a while. “What about those who put on bottles of minyak attar on their bodies when visiting mosques? The scent is usually so strong that at times I have trouble breathing! How can I focus on my prayers when I can’t breathe?” my Arshad debated. I had to admit that my boy had solid arguments. It is true. 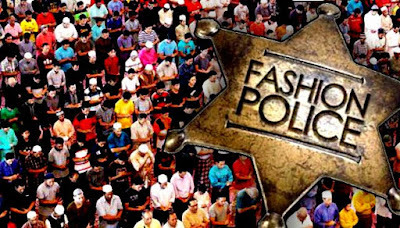 Those who pick on the attire of others should be focusing on their religious obligations instead of being the fashion police of the mosque. Anyway, on the first evening of Syawal, my boy eagerly dragged me to the living room and made me sit in front of the television set. “Look what some of our leaders wore during the Hari Raya prayers this morning,” he instructed. I smiled upon checking out the news. Pointing at the TV screen, he said, “Look ma, one is in a bright orange baju melayu while another is wearing a striking pink baju melayu – those attire are not only disturbing others, but they are also unsuitable as they tend to cause temporary blindness,” he joked. I nodded, eagerly anticipating his next argument. “But that’s the point. If everyone ought to be treated equal, there should not be a question of who’s who – kings, ministers, leaders or commoners – there should be no difference between us, right?” said Arshad once again making his point. I don’t think I have answers for all his questions. But clearly my son is wise. He is part of the youth of today who will not tolerate being spoon fed –and unwilling to accept what others are saying unless it makes sense to them. Out of curiosity, I asked my boy what he intended to wear next Friday to the mosque – “My brand new, imported Metallica t-shirt,” he answered with a smirk. I smiled. Perhaps it is time for us to follow in the footsteps of our younger generation and start asking questions. Stop being a “yes” man and have some guts to stand for what we believe in instead. After all, we’ve been tolerating so many things for far too long. Maybe it is time to call a spade a spade.